We’ve seen plenty of dead malls reborn as unusual things, from high schools to greenhouses. The Taiwanese city of Tainan is one-upping them all by tearing down an aging mall to create a network of sandy, shady lagoons. 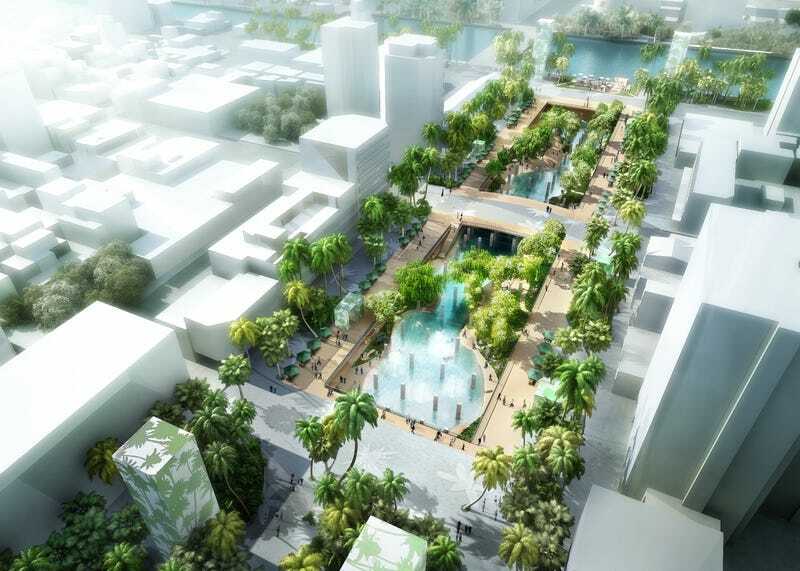 The city recently announced the winning design for a new public plaza on the site of a 1980s mall in Tainan’s downtown, which had “disconnected the city from its waterfront and soon fell into decline, becoming like the rotten tooth of downtown Tainan,” the designers say. The old mall will be razed to create the new public oasis that will be part-park, part-event space, part pedestrian street lined with restaurants and shops. But this isn’t your usual tear-it-down-and-build-a-park project. The winning team, led by the Dutch studio MVRDV and including local architects LLJ Architects and Taipei’s the Urbanists Collaborative, proposed something very interesting: They don’t want to tear out the entire mall. Instead, they want to leave the bare-bones structure that it sits on exposed. The concrete basin, once the parking garage for the mall, will function more like a pool bowl while providing a little reminder of the blight that once stood in its place. In the words of the studio’s founder, Winy Maas, it’s symbolic. It’s easy to see another huge reason the project will benefit the city, though: flood mitigation. Led mainly by the Dutch, coastal cities around the world are changing their approach to mitigating rising sea levels and extreme storms. Rather than building barriers, they’re create what the Netherlands calls “room for the river.” It’s an idea that proposes creating wetlands, lagoons, and flood planes where storm surges can run aground–slowing the speed of these surges and reducing the impact on fragile dams and other man-made barriers. Imagine a sponge, instead of a brick wall. While MVRDV–which is based in Rotterdam–doesn’t mention it specifically in its statement about the project today, this lagoon is a perfect example of creating room for floods. Maybe the fact that the designers don’t mention it is even more telling: Truly resilient infrastructure won’t just mitigate flooding–it’ll also make the city a better place the rest of the year.